I'm the archivist and a staff folklorist at the Vermont Folklife Center in Middlebury, VT. I hold a Ph.D. in Folklore and Ethnomusicology and an MLS with a concentration in archives and special collections, both from Indiana University. I am a public sector folklorist at a private, non-profit. My work involves managing our archival collection, instituting our digital preservation plan, and developing a sustainable approach for online access to our collections. I also take part in program planning, and participate in our public and educational programs. My research interests focus on the role of archives in the fields of folkloristics and ethnomusicology, and on theory and practice in ethnographic archives in general. I'm also interested in the use of audio recording in cultural documentation and ethnography. 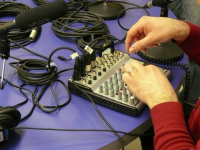 I present and consult widely on audio recording for ethnography and oral history; ethnographic archives; and digital preservation strategies for small institutions.